Village Utd v Dillons Cross Ath. AOH Cup 1st Round: Cork Road Celtic 0 Kinsale 5. AOH Cup 2nd Round: Los Zarcos 3 Cathedral Celtic 3 (Cathedral Celtic won 3-0 on pens aet); UCC A 1 Ballinhassig A 2; UCC B 5 Waterloo 3. St Michaels Cup 2nd Round: Rathcoole Rovers A 0 Millstreet Celtic 4; Glen Celtic A 4 Crescent Ath 1. Saxone Cup 2nd Round: Blackpool Celtic 1 Casement Celtic 5; Wilton Utd B 1 De Courcey Albion 2; Leeview Ath 2 Hibernians A 6. Presidents Cup 2nd Round: Buttevant B 0 Newmarket 2; Innishvilla B v Hibernians B (off). Premier League: Leeside 2 Killumney Utd 1; Park Utd 2 Knockavilla Celtic 2; Greenwood A 1 Wilton Utd 2. Premier A League: Castleview 1 Carrigtwohill Utd 1; Grattan Utd 0 Pearse Celtic 2; Kilreen Celtic 0 Springfield A 2; Bohemians 2 Leeds 1. AUL 1: Village Utd 0 Leeside 0; Fairview 3 Dillons Cross 4; Shandon Celtic 0 Watergrasshill 2. AUL 1A: Dunbar Celtic Glenthorn Celtic (off); Greenmount Rangers 1 Richmond 4; Glenvale 0 Douglas Hall 5; Grangevale 4 Donoughmore Ath 3. AUL 2: Ballincollig 0 CFC Banteer 1; Macroom 6 Ard Na Laoi 2; City Wanderers 3 Rylane Celtic 1. AUL 2A: Churchvilla 2 Glanworth Utd 2; St. John Boscos v Central Rovers (off); Springfield B 1 Corkbeg 1. AUL 3: Parkview Celtic 1 St John Boscos 2; Hillington 3 Greenwood B 0; Passage v Ballinhassig (off). AUL 3A: Carrigaline Utd 2 Glen Celtic 1; Carrigtwohill Utd 0 Dunbar Celtic B 2; Glounthane 1 Park Utd B 2. AUL 3B: Lakewood Ath 4 Bweeng 0; Strand Utd v Rathcoole Rovers (off). FAI Umbro Youth Inter-League Cup: Cork Youth Leagues 5 Limerick District League 2. Daly Industrial Supplies Youths League 1: Wilton United 0 Carrigaline United 0, Richmond 4 Kanturk 1. Daly Industrial Supplies Youths League 1A: St Mary’s 1 Buttevant 0, Riverstown 4 Everton 0. Lucozade Sport Munster Youths Cup second round: Passage 7 Glounthaune United 1, Mallow United 3 Kilreen Celtic 2. Daly Industrial Supplies U17 League 1: Castlebridge Celtic 3 Bandon 2. Lucozade Sport Munster Youths Cup second round: Douglas Hall 4 Park United 0. Daly Industrial Supplies U17 Premier League: Leeds 1 Castleview 1, College Corinthians 2 Carrigaline United 3, St Mary’s 4 Springfield Ramblers 1. Daly Industrial Supplies U17 League 1: Youghal United 0 Richmond 1, Ringmahon Rangers 0 Kilreen Celtic 2, Midleton 6 Strand United 2. Daly Industrial Supplies U17 League 1A: Everton 5 Carrigaline United B 0, Mallow United 3 Crosshaven 3, Kinsale 4 Avondale United B 1, Riverstown 7 Greenwood 0, Churchvilla 3 Wilton United 4. Daly Industrial Supplies U19 Premier League: Ballincollig 2 Midleton 3, Greenwood 1 Ringmahon Rangers 3, College Corinthians 1 Youghal United 0, Carrigaline United 1 Temple United 4. Daly Industrial Supplies U19 League 1: Avondale United 5 Cobh Wanderers 2, Strand United 10 Blarney FC 2, Mayfield United 4 Leeds 5. DONT FORGET TO PUT YOUR TIME BACK ONE HOUR TONIGHT. Members, friends and all involved at BLARNEY STREET ATHLETIC F.C. wish to extend their deepest sympathy to the Thompson family on the recent bereavement of William Thompson. William was one of the founder members of the club and acted in many key roles throughout his involvement over the years. A below par performance at the Cross was responsible for the AUL going down 0-2 to neighbours MSL in a dour encounter on Wednesday night. The first half was drab with the AUL having the better of chances but failing to convert. The second half more or less continued in the same vein with the AUL hitting the woodwork a couple of times. To be fair to the MSL, when their chances came about, though helped by some dreadful defending, they took them with apblomb. But, in the end and from an AUL view point, it was a performance on the night that was best forgotten. There will be Disciplinary Meeting at Turner's Cross this Wednesday at 7pm sharp. 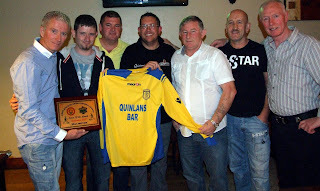 Jim Cashman (Murphy's Irish Stout) presents the September team of the month award to Trevor O'Sullivan (Hillington FC) at Quinlan's Bar on Monday night. Included also is Henry Healy (Cork AUL). 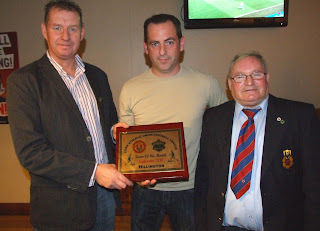 Henry Healy (Cork AUL) presents the September team of the month award to Hillington's Captain Trevor O'Sullivan. Included also is Jim Cashman (Murphy's Irish Stout) with players and supporters from Hillington. In conjunction with the September team of the month award held at Quinlan's Bar on Monday night, Gary Firmo (Quinlan's Bar) presents the Hilington Management Team with a new kit for the season. Daly Industrial Supplies U19 League 1: Douglas Hall 0 Blarney United 5. Daly Industrial Supplies Youths Premier League: Springfield Ramblers 0 Ballincollig 2. Daly Industrial Supplies Youths League 1A: Buttevant 4 Douglas Hall B 0. Munster Youths Cup second round: Fermoy 3 Richmond 3 (Fermoy win 5-4 on penalties), Riverstown 4 Everton 0, College Corinthians 5 Wilton United 1, Leeds 2 Carrigaline United A 1, Ringmahon Rangers 7 St Mary’s 4, Skibbereen 2 Kanturk 1, Park United v Douglas Hall A, Kilreen Celtic v Mallow United, Glounthaune United v Passage all postponed. Daly Industrial Supplies U17 League 1: Blarney United 2 Bandon 1, Castlebridge Celtic 4 Lakewood Athletic 1, Macroom 0 Coachford 6. Daly Industrial Supplies U17 Premier League: Rockmount v Avondale United, Leeds v Castleview, College Corinthians v Carrigaline United, St Mary’s v Springfield Ramblers all postponed. Daly Industrial Supplies U17 League 1: Youghal United v Richmond, Ringmahon Rangers v Kilreen Celtic, Midleton v Strand United all postponed. Daly Industrial Supplies U17 League 1A: Douglas Hall 1 Buttevant 3, Everton v Carrigaline United B, Mallow United v Crosshaven, Kinsale v Avondale United B, Riverstown v Greenwood, Churchvilla v Wilton United all postponed. Daly Industrial Supplies U19 Premier League: Ballincollig v Midleton, Greenwood v Ringmahon Rangers, College Corinthians v Youghal United, Carrigaline United v Temple United all postponed. Daly Industrial Supplies U19 League 1: Avondale United v Cobh Wanderers, Strand United v Blarney FC, Mayfield United v Leeds all postponed. Munster Junior Cup 1st Round: Glenthorn Celtic 2 Macroom A 3 (aet); Park Utd A 1 Leeside A 0; Blarney St Ath 2 Ard Na Laoi 0; Casement Celtic 5 Greenwood B 1; Greenmount Rangers v Kanturk (off); Parkview Celtic 0 Kinsale 4. Munster Junior Cup 2nd Round: Pearse Celtic 1 Springfield A 3 (aet); Leeds 1 Wilton Utd A 4; Knockavilla Celtic 6 Waterloo 1. AOH Cup 2nd Round: Fairview 0 Hillington 2; Lakewood Ath 4 Churchvilla 2; Hibernians B v Grangevale (off); Glanworth Utd v Newmarket (off). St Michaels Cup 2nd Round: Village Utd 4 UCC A 1; Cathedral Celtic 2 Douglas Hall 4. Premier League: Killumney Utd 6 Greenwood A 2. Bohemians v Blackstone Rovers (off). AUL 1: Buttevant 1 Leeside 1; Glen Celtic 3 Crescent Ath 0. AUL 1A: Rathcoole Rovers v Donoughmore Ath (off); Innishvilla v Glenvale (off); Millstreet Celtic 3 Dunbar Celtic 1. Ballincollig (off); City Wanderers 3 CFC Banteer 3. AUL 2A: St John Boscos v Brooklodge Utd (off); Central Rovers 1 Hibernians 4; Springfield B 3 Leeview 2; Wilton Utd v Corkbeg (off). AUL 3: Ballinhassig 1 Innishvilla 8; Passage v St John Boscos (off); UCC B 0 Afton Villa 8. Dunbar Celtic v Cork Road Celtic (off); Glounthane v Carrigaline Utd (off). AUL 3B: Bweeng v Rathcoole Rovers (off); Los Zarcos v Buttevant (off); Kanturk 2 Coachford 2. Coachford AFC would like to extend their condolences to the family of Derry Herlihy of Ballinlough who passed away last night & who played for Coachford for many years & also was a lifetime member of the club. Watergrasshill Utd are looking for a challenge game this Saturday or Sunday home or away. If interested please contact Niall O’Riordan 086-8540592. Shandon Celtic are looking for a friendly at home next Saturday at 2pm. This week’s Heineken Star Player prize for the highest points scorer on the Irish leaderboard is a VIP trip to the Emirates Stadium to see Arsenal v Marseille in game week 4. Runner up gets the amazing Heineken Champions League Fusball table so get playing and see if you can be Ireland’s top player tonight and tomorrow. To kick off the new UEFA Champions League season Heineken® introduces StarPlayer. Game to be played at a Cork venue nominated by the MFA. Game to be played at a Waterford venue nominated by the MFA. Both semi-finals are scheduled to be played on the week ending 12th / 13th November 2011. Come along to cheer the lads on as they venture into their first game of the competition. F.A.I.-UMBRO JUNIOR CUP 3RD. DRAW 2011-2012. 1 Mayfield Utd. v Ringmahon Rangers . 5 Glen Celtic v Leeds FC. 6 Pearse Celtic v College Cors. 7 Blackstone Rvs. v Tramore Ath. 9 Midleton FC. v Leeside FC. 12 Innishvilla FC. V Dunbar Clt. 14 Kilumney Utd. v Macroom AFC. Daly Industrial Supplies U17 League 1A: Buttevant 1 Mallow United 0. Gussie Walsh Perpetual Cup final: Leeds 6 Bandon 0. Daly Industrial Suplies Youths League Cup semi-final: Ringmahon Rangers 1 Leeds 1 . Daly Industrial Supplies Youths Premier League: Springfield Ramblers 1 Douglas Hall 3, Ballincollig 4 Kilreen Celtic 2. Daly Industrial Supplies Youths League 1: Carrigaline United 4 Knockraha FC 1, Glounthaune United 2 Fermoy 6. Daly Industrial Supplies Youths League 1A: Everton 0 Park United 3, Riverstown 7 Douglas Hall 1, Buttevant 2 Passage 3. Daly Industrial Supplies U17 Premier League: Springfield Ramblers 0 Carrigaline United 2, Castleview 7 College Corinthians 1. Daly Industrial Supplies U19 Premier League: Temple United 3 Castleview 4, College Corinthians v Ringmahon Rangers postponed, Midleton 4 Greenwood 4, Everton 0 Ballincollig 1, Youghal United 4 Carrigaline United 3. Daly Industrial Supplies U19 League 1: Avondale United 4 Douglas Hall 1, Strand United 1 Blarney United 6. FAI Umbro U17 Cup first round: Ringmahon Rangers 6 Richmond 3, Bandon 3 Crosshaven 1. Daly Industrial Supplies U17 Premier League: Rockmount 5 Avondale United 4. Daly Industrial Supplies U17 League 1: Strand United 3 Coachford 3, Lakewood Athletic 4 Macroom 1, Kilreen Celtic 2 Blarney United 1. Daly Industrial Supplies U17 League 1A: Avondale United B 1 Douglas Hall 2, Churchvilla 3 College Corinthians 7, Wilton United 2 Riverstown 6, Greenwood 1 Kinsale 6. FAI Junior Cup 2nd Round: Wilton Utd A 3 Carrigaline MSL 0; Ballinhassig B 0 Innishvilla A 4; Kanturk A 3 Douglass Hall 2 (aet); Ballincollig 0 Midleton FC 5; Pearse Celtic 3 Everton 2; Greenmount Rangers 0 Macroom A 2; Waterloo 0 Leeside A 7; Rathcoole Rovers A 1 Dunbar Celtic 3; Ringmahon Rangers 8 City Wanderers 0; Kinsale 7 Cathedral Celtic 0; Coachford A 2 Everton B 0; Blackstone Rovers 3 Glanworth Utd 2; Richmond FC 1 Fairview FC 3; Glasheen FC 2 Greenwood A 2 (Glasheen won 5-4 on pens aet); Blackpool Celtic 1 Mayfield Utd 7; Carrigtwohill Utd A 5 Doolans Cow FC 1; Fermoy FC 2 Knockavilla Celtic 4; Glenvale 3 Kilreen Celtic 0; Leeds 2 Blarney St Ath 0; Ballinhassig A 1 Killumney Utd 1 (Killumney won 3-2 on pens aet); Buttevant A 5 Leon Mountain FC 0; Tramore Ath 5 Castleview 4; Springfield A 3 Crosshaven FC 0; Bunratty Utd 3 Glenthorn Celtic 2; Abtran FC 3 Glen Celtic A 5. Presidents Cup 2nd Round: UCC B 2 Knocknaheeny Celtic 4. Premier A League: Bohemians 0 Grattan Utd 0. AUL 1: Crescent Ath 0 Knockraha 1; Dillons Cross 0 Leeside B 1. AUL 2: CFC Banteer 0 Casement Celtic 2; Rylane Celtic v De Courcey Albion (off); Ard Na Laoi 3 Killowen 2. AUL 2A: Corkbeg 2 Churchvilla 0; St John Boscos 0 Wilton Utd B 1; Brooklodge Utd 4 Leeview Ath 0. AUL 3: Hillington 6 Hibernians B 2; Afton Villa 1 St John Boscos 0; Passage 2 Parkview Celtic 2. AUL 3A: Cork Road Celtic v Glounthane (off). AUL 3B: Lakewood Ath 4 Strand Utd 0; Bweeng 1 Los Zarcos 2. De Courcy Albion are looking for a friendly at home this coming Saturday 22nd Oct at 1pm. Any interested parties, please contact Martin @ 087-2719425. 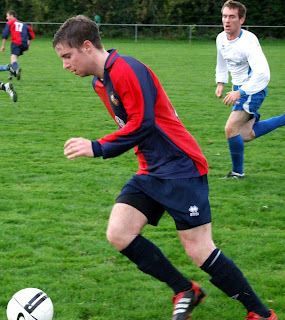 Lakewood's Eoin Forde who scored a hat-trick to help his side defeat Strand United 4-0 at Ovens on Saturday. The Gussie Walsh Trophy Final, Bandon v Leeds, will take place on tomorrow, Friday 14th October, at 7.30 in Turners Cross. Hope to see you all there! Hi All, We are having a Soccer Tournament Fundraiser in aid of cancer at 2pm on Saturday 29th of October in Mayfield Utd Sports Complex. This will be a knock out tournament and will consist of 8 teams. That night we will be having a fancy dress night in Mayfield GAA Club from 8.30pm with prizes on the night for best costume. Also on the night we will be having a head shave/waxing so if anyone would like a free hair cut or bit of waxing and wants to get involved then please let me know. This is all for a very worthwhile cause and your support throughout the day would be greatly appreciated. I have sponsor cards available for anyone who would like to get involved and help with our fundraising efforts. If anyone wants one then please sent me a direct mail and I will meet you or post one to you. We are also looking to collect spot prizes so if anyone can assist us or ask their employers then we would be extremely grateful, if employers need a written request than please let me know and I will send a letter.